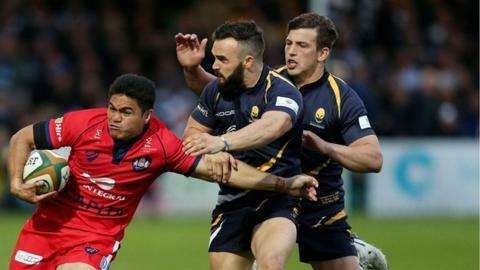 Worcester Warriors scrum-half JB Bruzulier says the character the team showed in their thrilling, last-gasp Championship play-off final win over Bristol augurs well for next season. The Welsh number nine, only playing in the absence of Charlie Mulchrone (injured) and Jonny Arr (suspended), was one of the stand-out performers. "We showed the spirit at this club," he told BBC Hereford & Worcester. "The character the boys showed says what we can go on and do next year." Bruzulier's only action this season had been in Warriors' Monday night reserve team, the Worcester Cavaliers, as well as captaining effectively a second-string Warriors side to victory in the British & Irish Cup. He then found himself thrust into the limelight when Worcester lost both their senior scrum-halves Mulchrone and Arr in the semi-final first-leg win over London Scottish. Worcester's return to the Premiership will not start until the weekend of 17/18 October, to avoid a clash with the Rugby World Cup. Premiership clubs have been allocated in the region of an extra £13million as recompense, to cover the cost of having no matches for what would have been the first six weeks of the campaign. The start date of the new season will coincide with the World Cup quarter-finals. But he was quick to pay tribute to the part the pair played in helping him perform to his maximum, both in the second leg and then in the two-leg final against Bristol, to help Worcester win back their place in the Premiership, a year on from being relegated. "The reason I've not been first or second choice all year is because they've been so fantastic," he added. "But they've been great with me over the last two weeks, helping me out with all the calls. "When you're playing for the Cavaliers, you can chill out and have fun. It's a more serious business with the first team. But it was great to be part of it all against Bristol and show such spirit. "Our defence was massive and to then come back from 14 points down with 10 minutes left to win was incredible. We didn't think we'd do it, but we had the character to see it through." While Bruzulier took his chance well over Warriors' final three play-off matches, the only scrum-half cover they had on the bench was 17-year-old schoolboy Jamie Shillcock, who was in the middle of revision for his 'A' levels at Warwick School. Shillcock, along with five other players (winger Josh Adams, locks Charlie Hewitt, 20, and Justin Clegg, 18, and props Gareth Milasinovich, 22, and James Page, 17) has now been rewarded with a place in the Academy set-up at Sixways next season. Current Academy player, lock Andrew Kitchener, has extended his stay at Sixways while continuing his studies at Birmingham University. Jack Singleton, Huw Taylor and Sam Smith make up the rest of next season's Academy squad, while Tiff Eden, Christian Scotland-Williamson and Mike Daniels, who signed contracts earlier this year, move into the first team squad. Meanwhile, prop Rob O'Donnell, 29, has joined Yorkshire Carnegie on a two-year contract after three years at Sixways, becoming the ambitious Leeds club's ninth signing ahead of next season.